In the old days, if you lived in a small town, you were lucky if you had two or three stations to choose from. Now the problem may just be way too many stations! But really that is the best problem of all for radio lovers. Make sure you have your cell phone data plan up to snuff, because audio can demand a lot of your mobile resources. It’s funny how, that with all of the exciting technology to play with these days, it’s still fun to just listen to the radio. 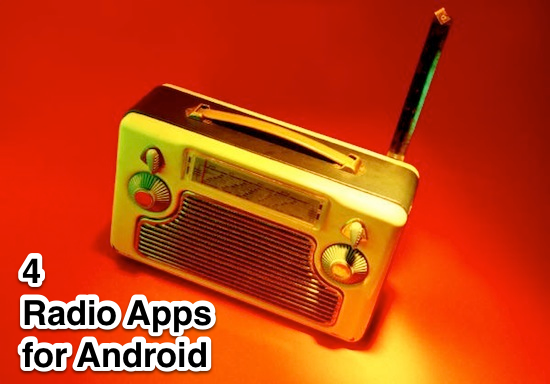 Download one or more of these apps to turn your smart phone into a radio. Now that’s progress. (Note: Apple fans don’t panic, we also got you covered with these 4 Radio Apps for the iPhone). Pandora Internet Radio enjoys the support of legions of fans. They love the way that it will play whole genres of music. It’s also great for those that have difficulty remembering song titles. But, according to some reviewers, not so great for those that want some specific song titles. Others enjoy that you can ‘like’ a song and the app will play similar songs. Experiences from the Pandora community indicate that if you have Pandora and want to install an update or another version then the best strategy is to first completely uninstall your current version to add the new one from scratch. TuneIn Radio is like having a top of the line short wave radio without having to jiggle the antenna to get different stations. The app brings thousands of live radio stations from all over the world right to your smart phone or tablet. In addition you get tons of podcasts and other content like concerts. The mobile app can be integrated with its desktop version to access your preexisting favorites. There is an alarm function as well as a timer to let you snooze to your preferred sounds. Being able to listen to foreign local radio stations from anywhere is a terrific way to learn about other cultures. PCRADIO is a good app to download if you want music without using a bunch of your memory. At a modest 1.6MB it will help to conserve your finite mobile resources while providing you with gobs of top notch entertainment. This app has the highest user rating for any app that I have seen. Must be that dedicated Lady GaGa channel. That brings up one of PCRADIO’s finer points. All of your stations and categories are already set up. Choose between artists and genres with ease. If you need assistance from the developer (unlikely, cause it’s a solid app), be sure to have a translator handy. rad.io features searches for numerous categories that let you tailor your listening to your favorite criteria like: language, nation, town, subjects and more. Its modest 1.3MB memory size won’t break the bank. With so much fascinating content available from local and international stations, those that have trouble making up their minds choosing from the vast audio smorgasbord will appreciate rad.io’s editorial recommendations. The app lets you choose from thousands of radio stations that run the gamut of world, local and everything in betwixt. Users love the apps ability to introduce them to new and fascinating sounds from their favorite genres.